WoW bots have been pretty much “a part” of WoW ever since Vanilla, and there’s no denying that World of Warcraft has had its fair share of issues with bots, up until not too long ago. Although there are a lot of reasons for which a player chooses to use WoW bots, primarily and historically, the most common reason was gold, earning it while basically you’re asleep. 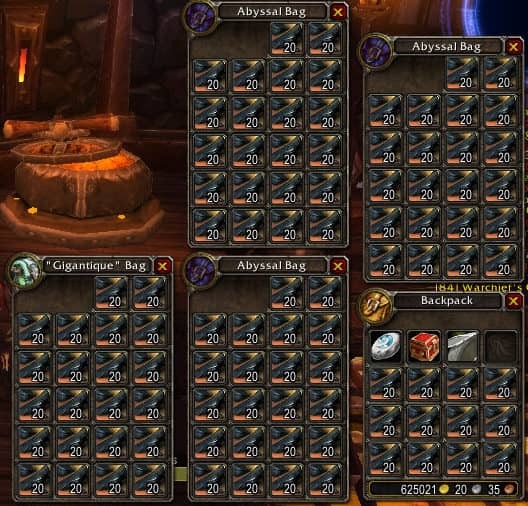 Gold farming through WoW bots is followed closely by leveling other characters, professions or even farming reputations and achievements. However, depends on where you’re looking, there are a lot of “reasons” to use WoW bots, and to be fair, in some cases it does sound tempting, I mean, who wouldn’t want free gold? And on top of that, lots of it. Or who wouldn’t want to maintain 5 alt characters, all geared up to a competitive level? Or, get this, who wouldn’t want to never have to do certain world quests or emissaries every single day, and yet get all the rewards? Given that there can be a fair amount of reasons to use WoW bots, let’s see some of the reasons not do bot in WoW! This is pretty self explanatory, but even so, it’s still the top reason not to use WoW bots, as it can and will lead to your WoW account getting permanently banned. In fact, at the time of writing this post, it’s been just close to 4 months since the last WoW botting ban wave, so even though that might sound like a lot, it’s really not, as Blizzard like to ban in waves of 6 months. On top of this, some players choose to make second WoW accounts designed just for botting, which technically helps keeping their main WoW account safe. But, who are we kidding? The more your botted account will “survive”, the more cocky you’ll get. Eventually, you’ll get confident enough to assume it’s worth trying to fish for a pet or an achievement on your main, and that’s when you’ll get banned, so it really is not worth it. 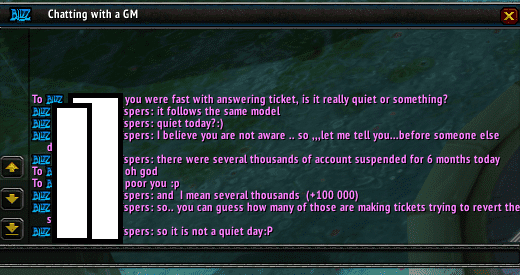 We’ve seen this happen numerous times as part of our WoW unban service, and it’s really unfortunate. Although this sounds like a cliché, it is a real thing. If you start using WoW bots, it’ll inevitably disconnect you from certain factors and aspects of WoW that got you to play in the first place, such as perhaps grinding or earning something. By using WoW bots, you’ll get used to different routines or standards, as well as taking everything you “earn” for granted, thus never having to worry about having to fish, farm herbs or even do world quests. 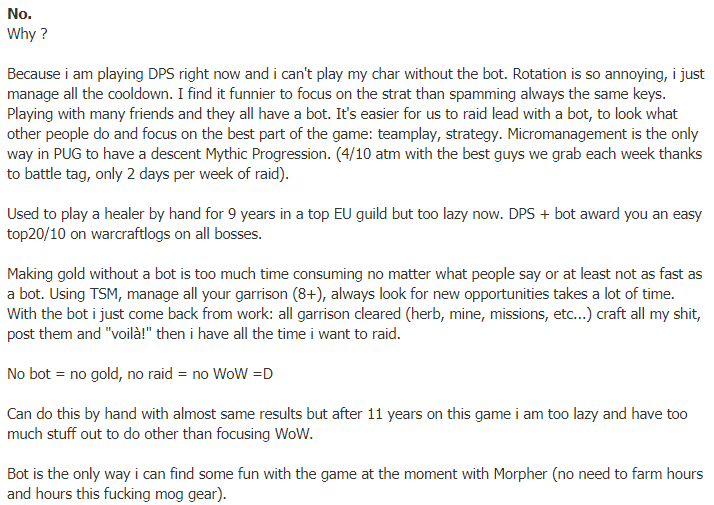 As you can see, while he has a point in regards to why he’s using a bot to play WoW, it’s obvious that he no longer enjoys the game, nor would he be willing or have the time to go back to doing all the content he wants to all by himself. That’s the problem, once you get used to botting, it’s extremely hard to let go and have to gather, quest and farm everything yourself. Once you get used to having everything you need with no effort, having to do so again by hand will feel like a chore and a nuisance, rather than a game you’re playing to have fun and relax in. And that’s the thing with games, especially with MMORPGs, you don’t have to have everything! You can’t, at the same time, be a world first raider, a rank 1 PvPer, the richest player on your server, have 20 fully geared alts, all the mounts, titles, pets and titles in game. And even if you do, through botting, you won’t enjoy them anymore, as they’ll lack the effort and work and even memories that come along with it. So, in a way, not only will the usage of bots in WoW cause you to lose the love and motivation for the game, but will also make WoW seem much more harder to play once you’ll realize you have to do everything manually again. So, better not get used to the bot in the first place, no? When you know you can obtain or farm almost anything, even notable achievements and titles such as Insane in the Membrane, it’ll certainly make you not really enjoy anything anymore. The joy of farming a dungeon for example, such as Stratholme in the hopes of getting the Deathcharger’s Reins mount, is nothing compared to simply having the bot do it while you’re asleep, and waking up to find it in your inventory. Pretty much any accomplishment will be reduced to how much time you’re willing to spend away from the computer so the bot can perform the tasks instead. If you get used to botting in WoW, nothing will sound appealing anymore, not even raiding, as a lot of players also use the bot’s combat routine system in order to maximize their DPS in raids. By using a WoW bot to do all of your activities for you in-game, you’re actively missing out on a ton of opportunities to actually have fun or even meet and make new friends. Even if you might not want or feel the need to make new ones, you never know who you’re gonna run into (and I mean that in a good way!). Ranging from making lifelong friends and even up to meeting your spouse, WoW can help you achieve both of those, as long as you play the game yourself, and not have a bot replace you. So, bottom line is, as long as you’re playing the game the way it was meant to be played, you’re bound to at least make a bunch of friends with whom you can even end up hanging out outside of the game, or, at the very least, hang out on Discord and even enjoy other games together. Disbanding guilds due to massive botting ban waves affecting too many guild members. So, what this means, essentially, is that it’s fine if you’re bored with the game, or simply don’t currently have the time or will to do all the things in it. Contrary to popular belief, World of Warcraft is here to stay, and it’s been like that for 14 years now. There’s more than enough time to obtain and earn anything you want, legitimately too, without fearing that one day you’ll be banned as a result of a bot flag you got a while back. 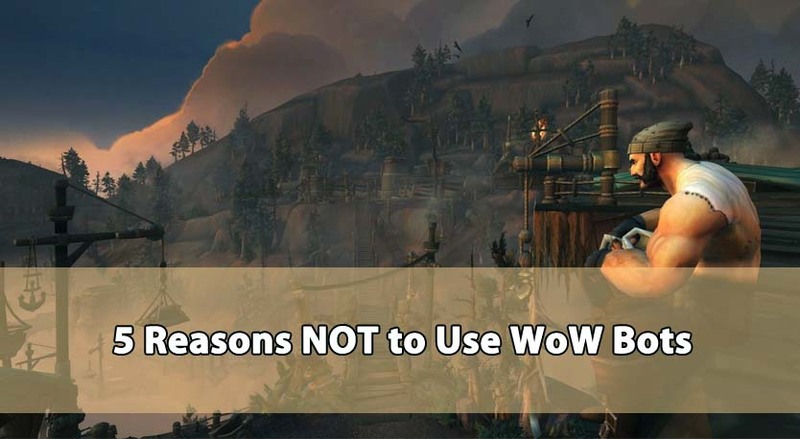 And lastly, resorting to botting should not be an option, and I hope the 5 reasons not to use WoW bots we mentioned above helped you change your mind if you were considering doing so!